The sabre was used extensively during the Napoleonic Wars, where Napolean’s heavy cavalry charges won him great victories. The single-handed blade was ideal for riders, and the curved blade optimised the sword for downward slashing strikes against infantry from horseback. The hilt incorporated a hand guard and a simple cross guard which, when the sword was used from horseback, would not have seen much use. The sabre was also used as a side arms by dismounted units, though these were phased out in favour of fascine knives and sword bayonets. Indeed, the popularity of the sabre dwindled by the mid 19th Century as improvements in projectile weapons led to the development of the accurate, long-range rifle and thus made cavalry charges, and the associated weaponry of the cavalryman, obsolete. 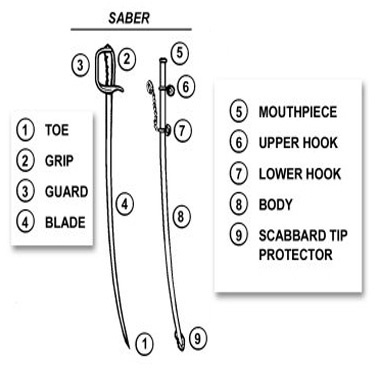 Nowadays, the sabre is only used outside of dress uniforms as a fencing weapon. Some scholars insist that modern sabre fencing is based on the cavalry sabre, citing the fact that hits are only permitted from the waist up, the target area of a man on horseback attacking a dismounted unit. However, most scholars believe the fencing sabre owes its origins to the lighter Italian duelling sabre.